When you add an email account to Outlook, a local copy of your information is stored on your computer. This feature allows you to access your previously downloaded or synchronized email messages, calendar information, contacts, and tasks without an internet connection. Certain types of accounts, such as POP accounts, store their information in Outlook Data Files (.pst files). 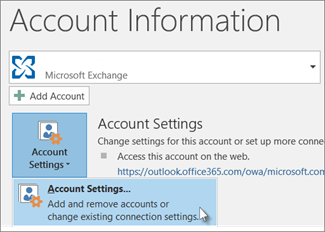 Outlook 365 accounts, Exchange accounts, IMAP accounts, and Outlook.com accounts store their information in Offline Outlook Data Files (.ost files). An Outlook Data File (.pst) contains your messages and other Outlook items and is saved on your computer. POP accounts—which is a common type of account you can create when adding an email account from an internet service provider (ISP) like Xfinity or AT&T or Cox—download all of your email messages from your mail server and save them on your computer. Note: In Outlook 2013 and earlier versions, IMAP accounts also used an Outlook Data File (.pst). In Outlook 2016 and Outlook for Office 365, IMAP accounts use Offline Outlook Data Files (.ost). You can also use an Outlook Data File (.pst) to backup or export items from any type of email account. For more information on backing up your email messages, calendar, contact, and task data, see Export or backup email, contacts, and calendar to an Outlook .pst file. You can also import email messages, calendar, contact, and task data from another Outlook Data File (.pst). For more information about importing items, see Import email, contacts, and calendar from an Outlook .pst file. Note: You cannot import from an Offline Outlook Data File (.ost) file. Because these files are saved on your computer, they aren’t subject to mailbox size limits on a mail server. By moving items to an Outlook Data File (.pst) on your computer, you can free up storage space in the mailbox on your mail server. When messages or other Outlook items are saved in an Outlook Data File (.pst), the items are available only on the computer where the file is saved. Most other account types, such as IMAP accounts, Office 365 accounts, Exchange accounts, and Outlook.com accounts use an Offline Outlook Data File (.ost) file to store a synchronized copy of your mailbox information on your local computer. When your connection to the mail server is interrupted, for example, when you're on an airplane without WiFi or if your internet connection disconnects, you can still access all emails, calendar data, contacts, and tasks that have been previously downloaded. You can read and compose messages, create appointments, and add contacts. However, your email messages won't be sent and no new messages will be downloaded until your internet connection is restored. When the connection is restored, changes are automatically synchronized, and the folders and items on the server and on your computer are identical again. In right pane, click Account Settings, and then click Account Settings. On the Data Files tab, click an entry, and then click Open Folder Location. Outlook Data Files (.pst) created by using Outlook 2013 or Outlook 2016 are typically saved on your computer in the Documents\Outlook Files folder. If you upgraded to Outlook on a computer that already had data files that were created in Microsoft Office Outlook 2007 or earlier, these files are saved in a different location in a hidden folder at drive:\Users\user\AppData\Local\Microsoft\Outlook.